Has a nice nursery rhyme vibe to it, in my opinion! Thank you so much for your comment. Although that wasn’t the voice I heard in my head as I wrote the poem, I love that you heard another – one that suggests magical things and innocence. Perhaps when we write poetry, sometimes we revert to the time and space and mind of a child, and in doing so, experience life anew. That is truly lovely. Thanks. The picture TOTALLY complements the lovely poem.. Can’t say which one came first.. the poem or the picture! Really nice!! The picture came first – but then… the memory of my daughter, riding lonely on a new school bus, without friends, seeking solace in one tree on the horizon that every day greeted her, and made her feel at home. She is in her thirties now, yet the tree still stands, looking happy as always, waving to other children. So the answer to your question? The poem. Thanks Richard. Glad you enjoyed the image and the words. I checked out your home page – it’s cool! I like the energy that emanates from it. I love the colors in ur pic. It is a nice shot! Have a peaceful and defended feeling when watching this sight! Thanks Sue. 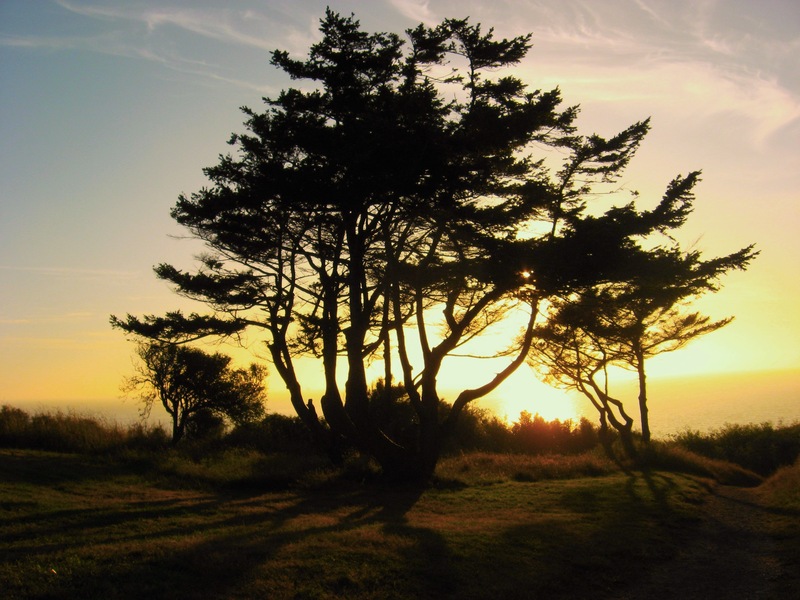 The tree lives on Whidbey Island, at Fort Casey. Lovely tree – lovely place. Wonderful!! and such a gorgeous spiritual photo. Cindy, I so loved Vespers. I never really appreciated an individual tree til I moved to the Northwest, and now I’m so often struck by the beauty of a tree I pass. You’ve spoken perfectly about that feeling. You’ll become a tree-hugger yet… Thanks for your comment and continued support of my bloggings. Still thinking of your garden everytime I water mine. I pretend my one rose is as glorious and my one hydrangea as full – alas, they haven’t got the northwest climate nor your loving touch.